Three-day-long ‘8th Kibria International Print Fair 2019’ concluded on February 17, 2019 at Zainul Gallery, Faculty of Fine Arts, University of Dhaka. Education minister Dr Dipu Moni inaugurated the fair on February 15, 2019 while renowned artists Rafiqun Nabi and Monirul Islam graced the occasion by their presence. Eminent printmaker Syed Abul Barq Alvi presided over the inauguration ceremony. This fair was arranged to pay tribute to the late eminent printmaker Mohammad Kibria. Eminent and young printmakers from 20 different institutes, organizations and studios from Bangladesh and India participated in this fair. Internationally renowned printmaker Shahid Kabir received life-time achievement award for his extraordinary artistic journey. 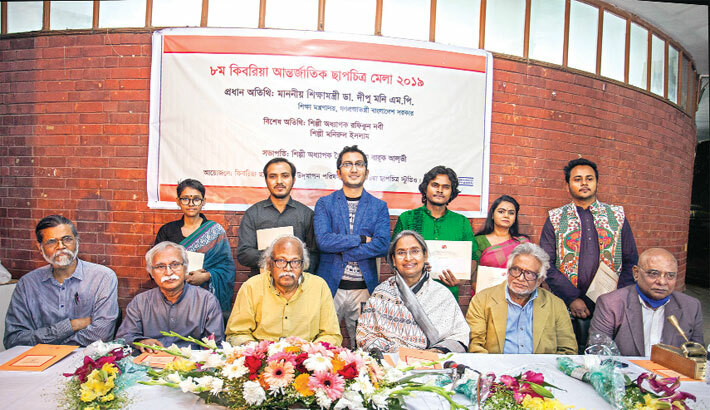 Meanwhile five young printmakers, namely Nasrin Jahan Anika, Sourav Chowdhury, Rafiqul Islam, Mashiur Rahman and Faria Rahman, were also awarded for their outstanding effort in printmaking. The participating institutions were - Graphic Art Department, Kala Bhavana, Visva-Bharati University, Shantiniketan; Graphics Department, Rabindra Bharati University, Kolkata; Department of Printmaking, Faculty of Fine Arts, University of Dhaka; Department of Printmaking, Institute of Fine Arts, University of Chittagong; Painting-Oriental-Printmaking Department, Faculty of Fine Arts, Rajshahi University; Printmaking Discipline, Institute of Fine Arts, University of Khulna; Department of Fine Arts, Jatiya Kabi Kazi nazrul Islam University; Department of Fine Arts, Jagannath University and Printmaking Studio, Department of Fine Arts, University of Development Alternative (UODA). Some other organizations, namely Multiple Encounter, Delhi, India; Safiuddin Bengal Printmaking Studio, Dhaka; Shunno Art Space, Dhaka; Atelier ‘71, Dhaka; Cosmos Atelier ’71, Dhaka; Bangladesh Printmakers Association, Dhaka; Flame Arts Open Studio, Dhaka; Studio 48, Dhaka; Karkhana Art Space, Dhaka; Bornika Print Studio, Dhaka and Kibria Printmaking Studio, Kala Kendra, Dhaka, also participated in the fair.